I managed to be disorganised enough to miss the eighth anniversary of keeping a blog yesterday. In those eight years I have written 544 with this post now being Number 545. It’s been another slow year of 50 published posts. I guess it’s a slight increase on last year’s 45 but a long way down on the year before’s really productive year of 88 published posts. As ever, there’s a big backlog of posts to complete but at least I’m already into 2014 and most of those to complete are the multi-part festival posts. 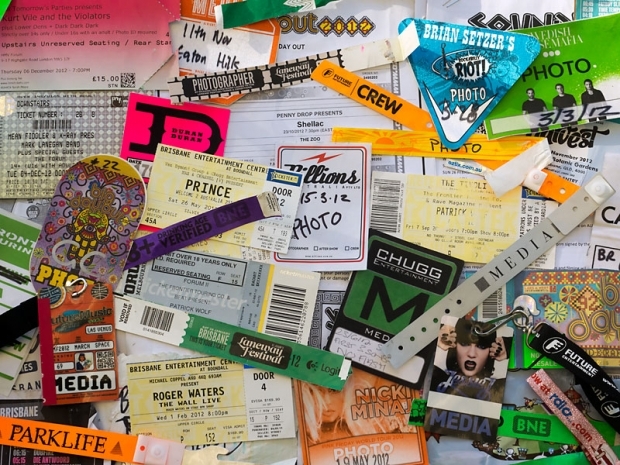 I still haven’t put together my round-up of 2013 or even taken a photo of my 2013 photo passes and tickets, an ever-shrinking pile, hence a repeat of last year’s photo. Every year I publish this post and it’s only as an afterthought that I consider that I probably should have included a list of the most popular posts during the year. This entry was posted on Tuesday, March 25th, 2014 at 12:41 pm. It is filed under Music Photography and tagged with 2013, Blog, Brisbane, Eight, gigs, Justin Edwards, Live music, Music Photography, Photos. You can follow any responses to this entry through the RSS 2.0 feed.